His composition style was a unique hybrid of American folk idioms and modern classical music and is identified by his iconic use of percussive orchestration, changing meter, polyrhythms, polychords and tone rows. Many of Copland’s works incorporated slowly changing harmonies that aptly depicted open landscapes. 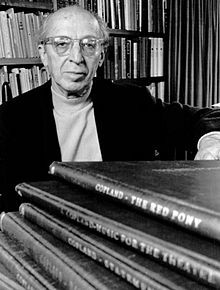 In addition to composing famous American classical works, Copland wrote books, taught and conducted his own works. Pretty magnificent! As a result of his support of the Communist movement in the 1936 election, Copland was blacklisted and his work Lincoln Portrait was removed from the program for the 1953 inaugural concert. Despite his political troubles, he was awarded the Pulitzer Prize for his famous composition Appalachian Spring. Additionally, his scores for “Of Mice and Men” (1939), “Our Town” (1940), and “The North Star” (1943) all received Academy Award nominations, while “The Heiress” won Best Music in 1949. Remember the beef commercial? You’ll recognize the music here–it’s Copland’s “Hoedown” from the ballet Rodeo.